Radial Engineering is based in Port Coquitlam, BC, a short drive from Vancouver. A longstanding reputation for bringing reliable and tough-as-nails problem solvers to the market means you will see Radial products on stages and in studios world-wide. These products include the world's finest direct boxes, splitters and audio interfacing devices. As the maker of some of the best pro audio gear in the business Radial’s products have graced the stages and studios of many of music's biggest acts including Rush, U2, Bruce Springsteen, AC/DC, Billy Joel, Paul McCartney, Al Schmitt, and Elliot Scheiner, among many others. In business since 1992, the company is responsible for what are arguably two of the best direct boxes on the market, the JDI and the J48. Radial products are also regularly chosen by audio/video integrators for use in non-music applications but where pristine audio is required. With approximately 100 employees, Radial boasts in-house research and development, and engineering and production departments where all the products are proudly Canadian-made. 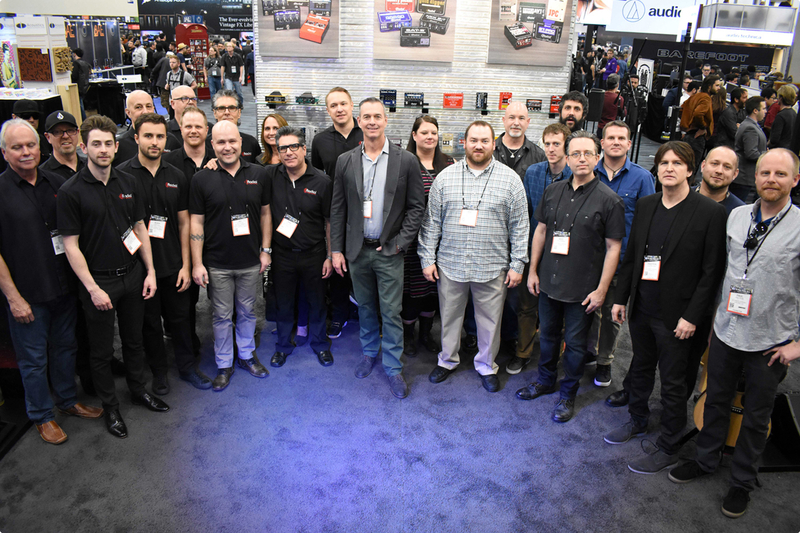 An extensive network of dealers and distributors makes Radial product available around the world. In 1976 Radial Founder Peter Janis began his journey in the music and pro audio industries with a music store gig in Montreal, Canada. As a musician, he put in his time on the road playing keyboards and guitars. He eventually migrated to designing audio systems for PA companies and in 1980 was headhunted by TMI, the main shareholder of Fender Musical Instruments at that time. After a successful 10 years of working with TMI, having amassed an arsenal of technical and marketing knowledge and skills, in 1990 Janis started his own marketing company. He provided services to various companies in the industry including Canadian cable company, Cabletek. 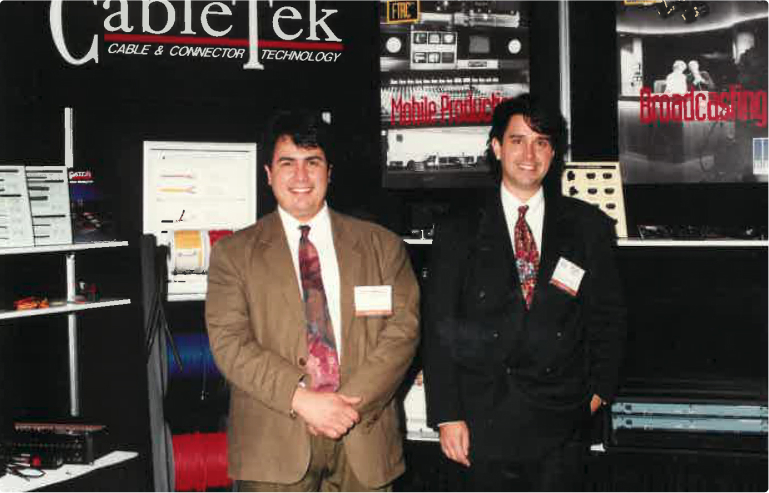 His relationship with Cabletek grew, and in 1991 he saw an opportunity to take it over and get back to what he loved best; the gear. Renaming the company in 1992 to JP Cabletek Electronics Ltd., Janis imported an array of brands such as Presonus, Audix Microphones, Hafler, Microtech Gefell, Mogami cables, Jensen Transformers, Sonex acoustical products and many others. Over the next few years the company grew to making custom snakes while Janis toyed with the idea of going more global. Coming up with a company name that could be easily translated into many languages (Radial Engineering) and a logo that represents the inside of a quad cable, in 1996 he launched the first Radial product, the Radial JDI. While working at another music store in Edmonton, Janis became friends with a store colleague who happened to be the area’s top session player. His friend shared with Janis that he had received a Jensen Transformer in the mail and said that once he built a direct box with this ‘holy grail’ that it was going to make his guitar sound like the Gods intended. After hearing the result Janis was hooked on the concept of transformers and building gear that brought it all together – the best sounding interface gear employing the best sounding transformer technology, to make the best possible music. The opportunity market for direct boxes was just waiting to be dominated. Janis had observed many techs using scrap aluminum to build homemade direct boxes so he went about developing and manufacturing off –the-shelf options. Radial’s first direct box, the JDI was born and exports to the US soon followed. 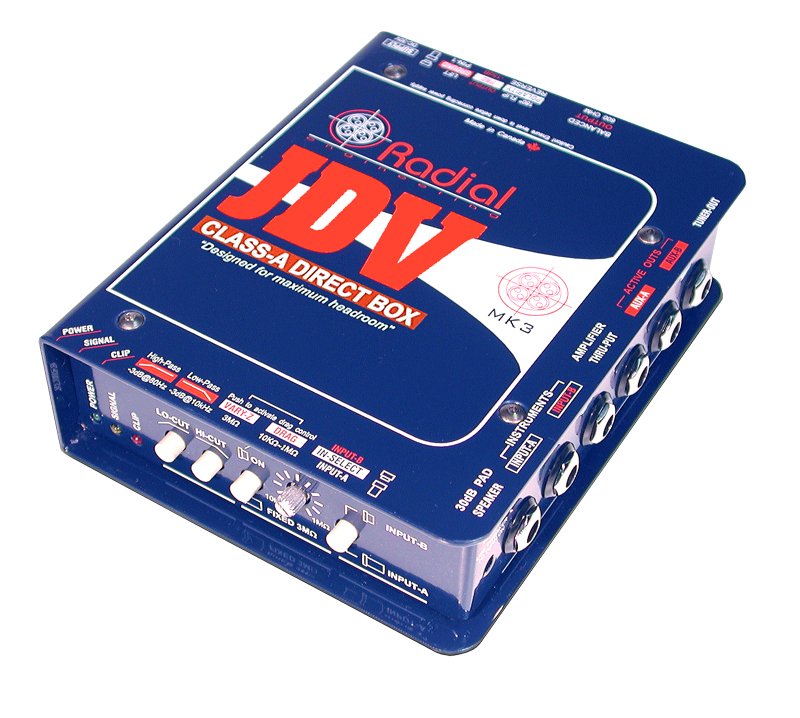 The Radial JDI remains one of the most popular DI boxes of all time. Expanding on the success of the passive JDI, Radial’s engineering team began to develop an active DI - what was to become the JDV. The origins of the JDV can be traced back to the 1980s when Vancouver was a hot-spot for producing some of the most commercially successful recordings of all time including works by artists Bryan Adams, AC/DC, Metallica, Elton John, Aerosmith, Loverboy and Bon Jovi. 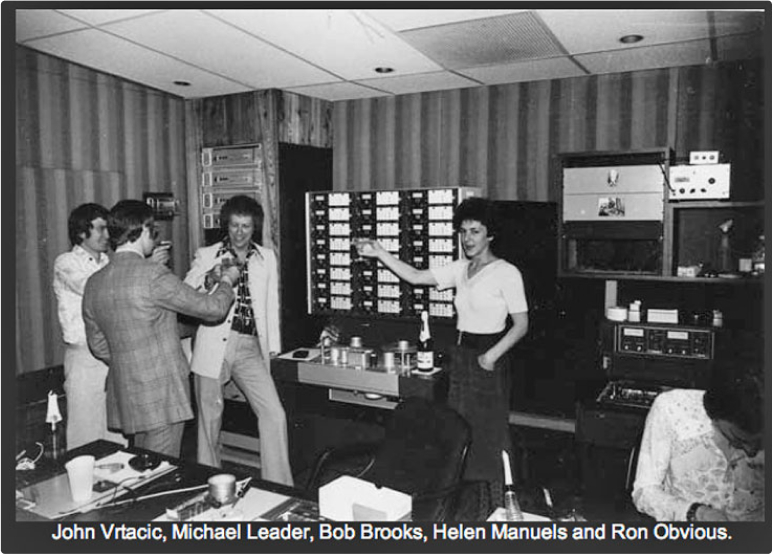 Home to Bruce Fairbairn and Bob Rock, Little Mountain Studios was the epicenter. Behind the scenes, was studio designer and technical whiz John Vrtacic. Vrtacic was the guy who designed monitors, modified and rebuilt consoles and created many of the unique tools that set Little Mountain Studios apart and later, Bryan Adams’ Warehouse Studios and Jim Vallance’s The Armoury. Artists would often talk about the amazing bass sound that Vrtacic’s custom-made direct box produced. He had discovered a way to buffer the signal without the use of negative feedback and when scoped, his DI produced an incredibly accurate sonic picture that was simply unattainable by any other. 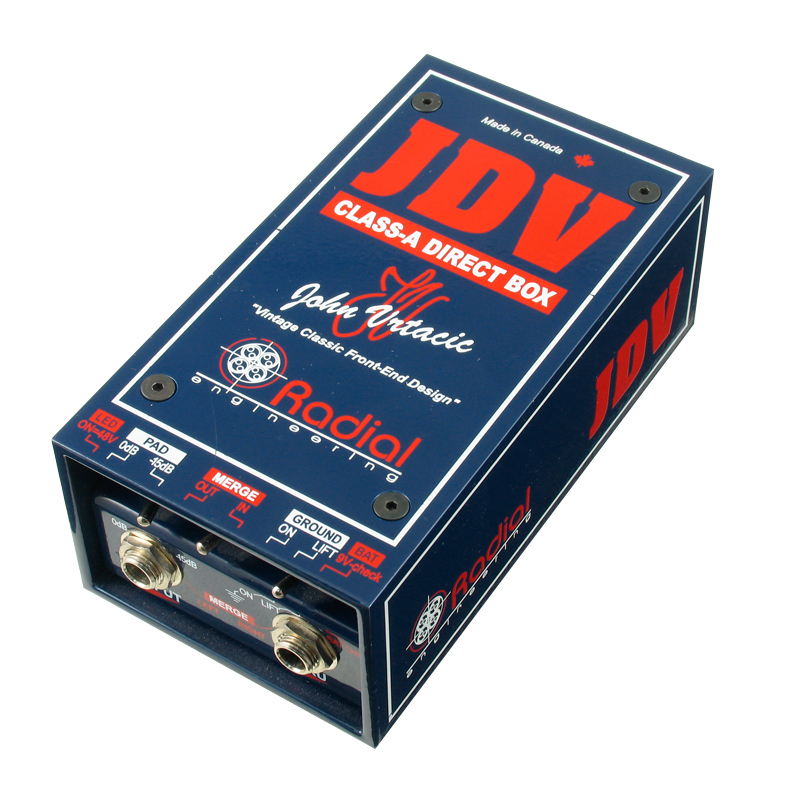 It was around this time Radial asked Vrtacic's assistant Ron 'Obvious' Vermulen to compare various direct boxes using his Audio Precision tester looking to prove that the JDI was best. During these tests Vermulen also elected to test Vrtacic's custom made direct box. The results concluded that Vrtacic’s box was superior to the other active direct boxes on the market. As Radial was developing its first active direct box, they approached Vrtacic to see if he would sell his design. He did and the first generation JDV – V for Vrtacic – was brought to market. Over the years, the JDV has gone through several changes. During each evolution, improvements have been made to enhance the performance while remaining true to Vrtacic's original design. The current incarnation is the JDV Mk5. In 2000 the first sister company of Radial Engineering came to be when Primacoustic was launched to allow for the development of its own line of acoustic treatment products, replacing the Sonex line that was previously being sold and distributed. The original product line was a foam-based product and eventually the company migrated to the more effective Broadway glass wool range that is still selling and being expanded on today. The company’s highly popular London Room kits were developed to simplify the science of acoustics when treating a room. Various sized Broadway panels are bundled to treat small to larger rooms and are now part of the foundation of many of today’s producing, engineering and mastering pro studios. The Primacoustic product line continues to grow and includes a variety of ceiling panels, clouds, bass traps and diffusers. These can be found in many studios owned by the likes of Bruce Swedien, Al Schmitt, Jacquire King and Mark Ronson. As quickly developing horizontal market opportunities came to be discovered, Primacoustic expanded beyond a music industry focus to include an install division which has become well respected with a vast client list including the Vancouver and Whistler 2010 Winter Games, the U.S. Military, Facebook, the Canadian Mint, Caesar’s Palace, and Disney World’s Harry Potter Diagon Alley. One of the first types of gear Janis began to tool around with, long before launching Radial as a company, was distortion pedals. In fact, it was 1976 when he and a friend began creating some. Janis admits the first one was terrible and he abandoned that pursuit for a time. While he was busy building his cable business, his friend continued to create pedals. By 1996 Janis’ love of the guitar and desire to make complementary gear that could change a guitarist’s tone led to him to hire his friend as lead engineer and take on the Tonebone brand. In 2001 Radial began selling the Tonebone line of products, starting with the Classic and the Hot-British pedals. It was also at that time the JDI underwent revision and the now Radial standard book-end shell design was incorporated. At this time all Radial products began to ship globally. In 2002, Radial introduced a ‘new generation’ active direct box, the Radial J48. The intent behind the Radial J48 was to provide the musician with the benefits of a high ‘input impedance’ to reduce pickup loading while providing a superior internal rail voltage to handle the huge transients of today’s active acoustic guitars and basses. It also had to work without batteries, while deriving its power from 48V phantom as the use of batteries is an unwelcome necessity in the world of pro-touring. 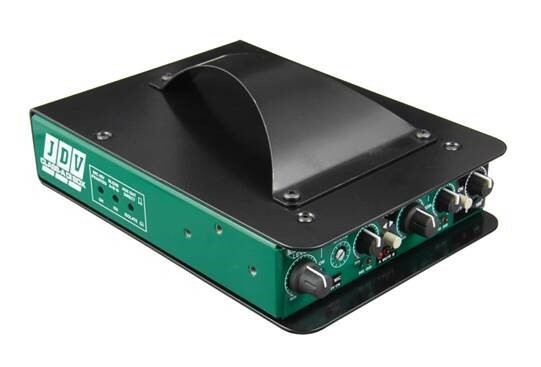 The solution: following the path set by power amplifiers, the J48 employs a noise-free internal digital switching power supply that converts the phantom power to AC and back to DC for greater rail voltage and more than doubles the headroom. With greater headroom comes less distortion and less compromise. Instead of bandwidth limiting the signal as others do, the J48 extends to 160kHz - this is not a typo - 160,000 cycles per second. Keep in mind that digital switch-mode technology did not exist back in the ‘80s, nor did the plethora of active acoustic guitars, high-output basses, digital pianos or electronic drums. 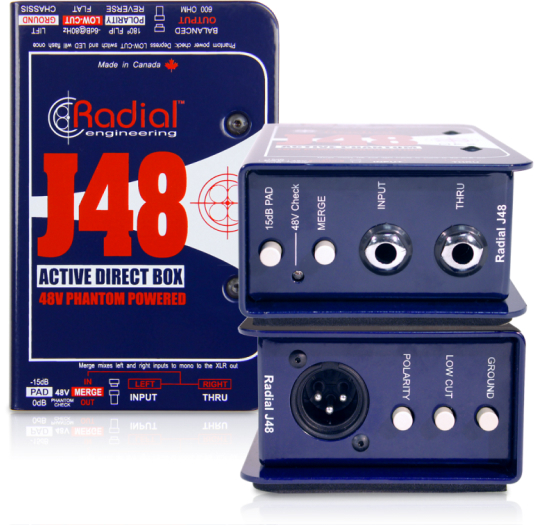 The Radial J48 is a direct box made for today’s world of musical instruments. Also in 2002, the decision was made to produce a lower priced direct box that would enable the average musician to afford Radial quality. At that point, Radial DI boxes were only used by top touring professionals. But the company was getting requests to deliver a product that the average music store could supply. So Radial approached Jensen and asked them to build a lower priced transformer that would enable Radial to produce a DI box that could sell for $99. Jensen said that in order for them to attain the quality that has made them famous, there was simply no way they could do it. 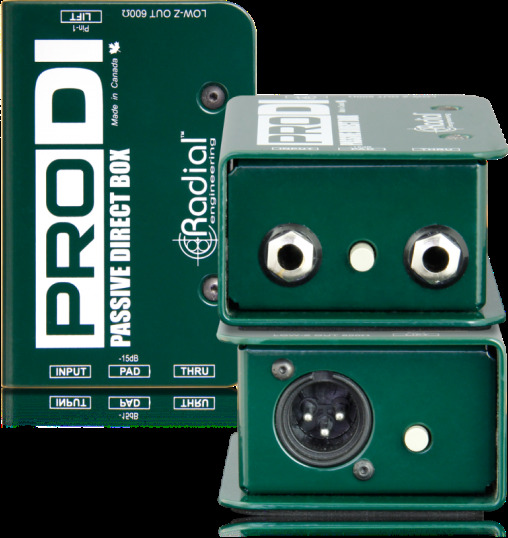 As an alternative, in 2004 Radial approved a custom-made transformer and this is now used in a variety of Radial products including the ProDI, ProD2, ProAV1, ProAV2 and the ProD8. As for how it sounds? Well... considering Pro series products have toured with Herbie Hancock, Rush, U2 and Lady Gaga, I guess you can say it is pretty darn good. Prior to 1994 anyone wanting to re-amplify a previously recorded audio track from a professional tape recorder had only a few options. The most common technique was to drop the gain of the tape recorder's output to a modest –30 or more and feed it into the back end of a passive direct box's XLR connector. Then connect the direct box's ¼" input jack to the guitar amp's input. The result was disappointing at best for a number of technical and practical reasons so the process of Reamping never really caught on in a big way. In 1993 engineer John Cuniberti, while in the studio recording with Joe Satriani, Cuniberti began to realize that the current issue was a simple interface problem with no off-the-shelf solution, so he and audio tech James Ganwer set out to build a box with off-the-shelf parts for the purpose of Reamping. The project was a success from a technical standpoint but took several years to gain traction in the market. The sheer high cost of parts complicated the situation. Several years and changes in the market place later, Cuniberti, realizing the difficulty in building a small-scale product economically, decided to sell the company. Realizing the importance of this technology, Radial Engineering Ltd. purchased the assets and in June 2011 began shipping a Radial version of the original. "I am honored that engineers and recording artists from all over the world used the Reamp on their recordings. To be honest, I thought it was a good idea in 1993 but never dreamed it would be this popular today." Over the years Radial was one of the biggest customers of Jensen Transformers, the iconic transformer company that set the bar for great sound. When supply was not able to keep up with demand Radial decided to purchase the company. 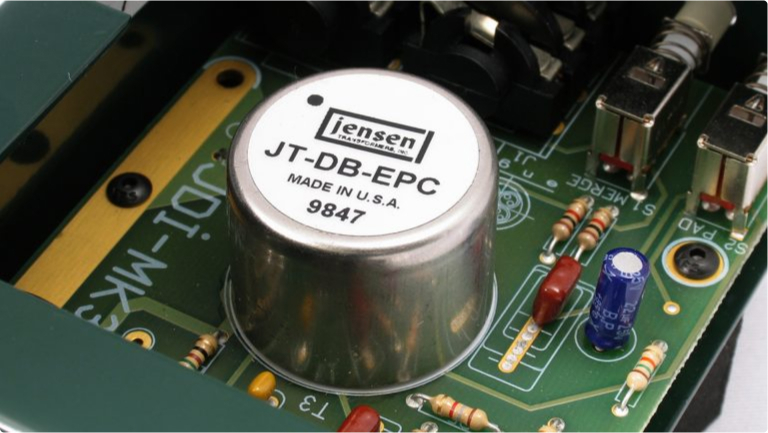 It invested in a bunch of new machinery to increase production for its OEM side as well as ensure Radial J series products were able to be made with the outstanding Jensen transformers. And it remains under the Radial umbrella and in many of its products. Radial was acquired by Regimen Equity Partners and CEO Mike Belitz of Ultimate Support Systems in January 2018. Ultimate Support and Radial Engineering Ltd. will enjoy shared strategic and logistical advantages under leadership of Belitz; with wider availability to retailers, distributors, and end-users all over the world. Radial continues to be dedicated to the creative process, in finding ways to facilitate the life of the touring musician and recording engineer. For those who are creative, the very notion that 'it has all been done' is not an option. There may be only 12 notes to a western scale, but if you think about it... there are many frequencies in between each half-note that are used in eastern music plus an infinite number of rests and poly-rhythms that can be combined to push music outside the confining walls of 12 bar rock & roll. Creative options are, in fact, unlimited. At Radial, we have a similar point of view: bringing innovative recording tools to market is all about nurturing the creative spirit. As a manufacturer, our task is to find ways of opening the door to new processes by pioneering innovative products that will enable the more adventurous engineer to find new sounds which in turn will enhance and enthral the audience. With an acoustical products division, a transformer company, two Hifi divisions (Hafler and Dynaco- one of which focuses on studio and commercial), and a plethora of creative people, Radial covers all bases with its home run products.